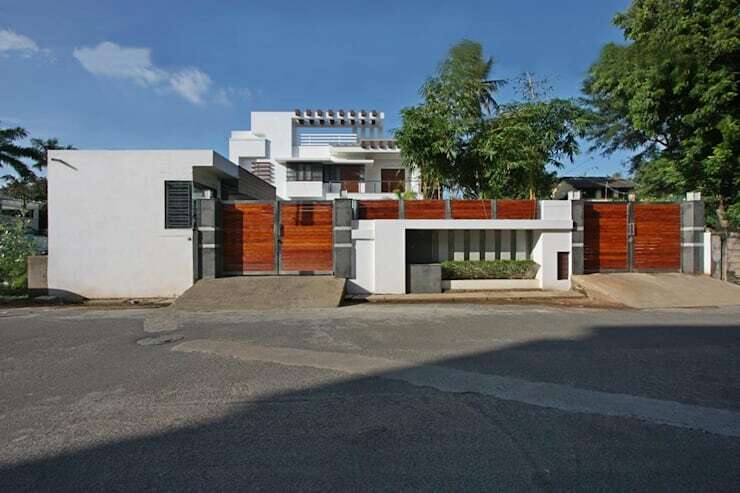 This south facing residential building located in Kumbokanam, Tamilnadu has land area of 15,000 sq ft and built up area of 8,000 sq ft. A large area in the front has been reserved for landscape and garden. This also helps in reducing roadside noise pollution from the house. Exterior of the house looks sleek with the use of plain white finish combined with wooden and glass handrails. Corner windows are designed to give ample amount of natural lights to the interiors as well as giving an aesthetic look to the exterior. Pergolas designed at different levels give a bold look to the house. Courtyard has been planned in the western side running along the length of the house. Courtyard position is planned in such a way that it acts as a buffer to sun light and heat. 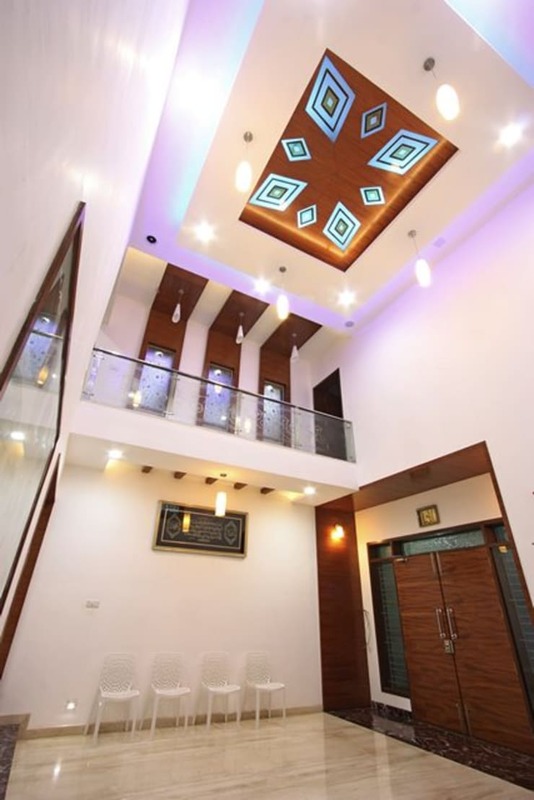 The ground floor comprises of 3 bedrooms, an office room, living, dining and a kitchen. 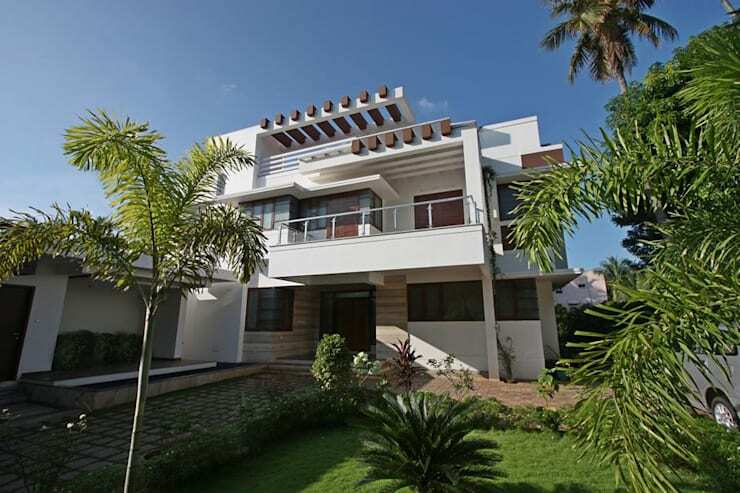 First floor has 4 bedrooms, a family room and a terrace garden. Interiors of the house follow minimalistic and contemporary style combined with luxury and richness in necessary areas. 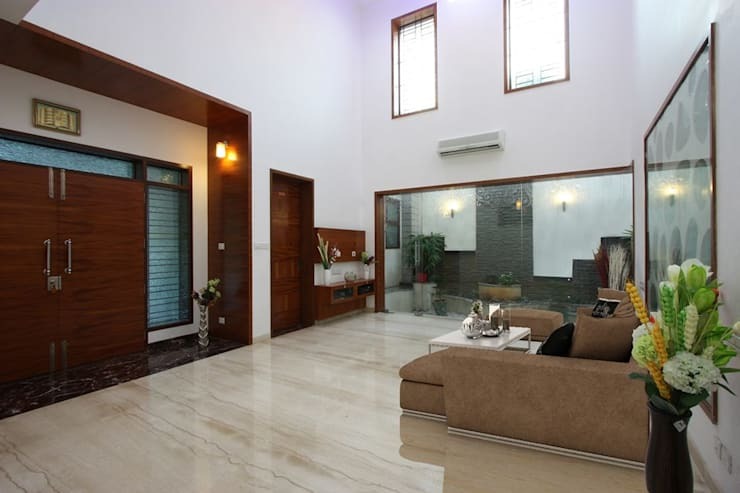 Living room in the ground floor with double height ceiling give a spacious and warm look to the house. 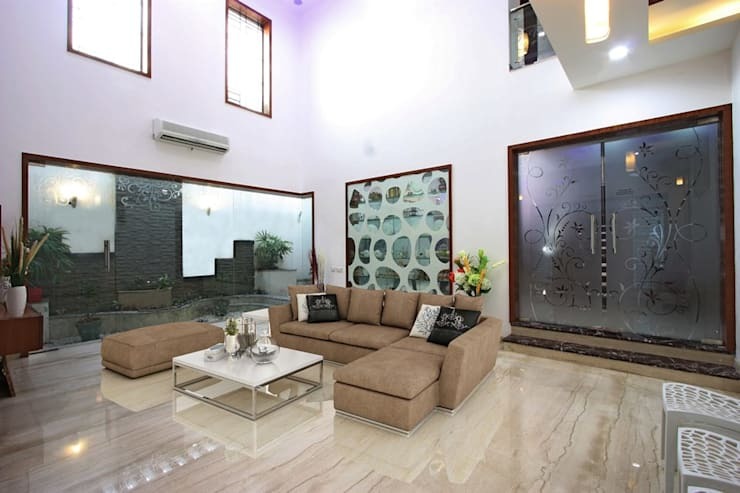 Glass door and partition divides the living room from rest of the functional areas of the house. Dining and living room gets the view of courtyard divided by large glass panels. Centrally located staircase divides the dining and ladies living in the ground floor. Handrails are designed in intricate floral motifs on the glass to create a delicate look. A wall created in the center of staircase area with niches act as a partition between dining and ladies living. Daughter's room in the first floor has been specifically designed in subtle pink and white color scheme with curves for a feminine look. 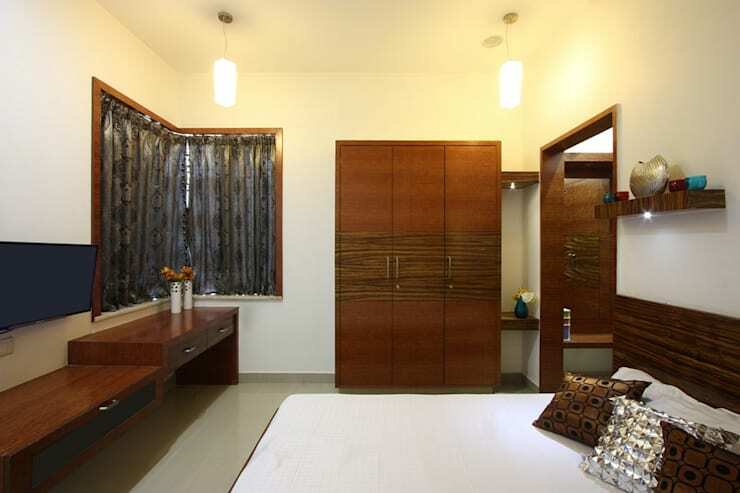 Son's bedroom present a bold look with the use of angular lines and wooden false ceiling. Veneer finished paneling, concealed light and rich curtains and upholstery helps to combine luxury with contemporary style. Exterior view of the south facing house. 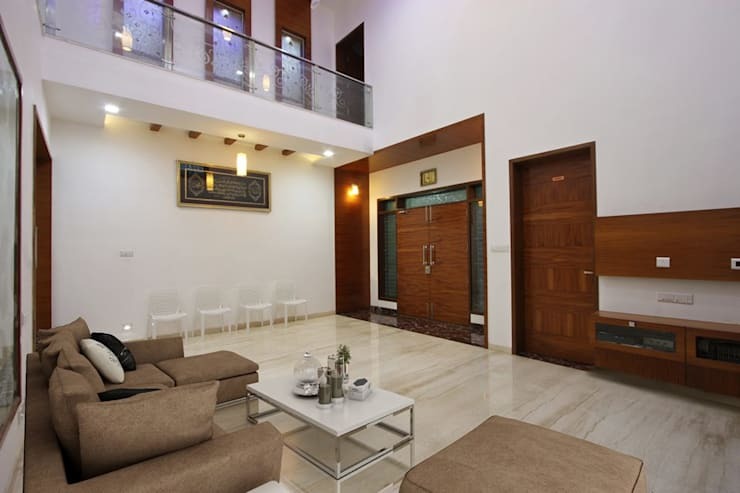 ["IN"] [Published] A Lavish Chennai Home with Glorious Design Touches! A large area in the front is designed with landscape and garden. 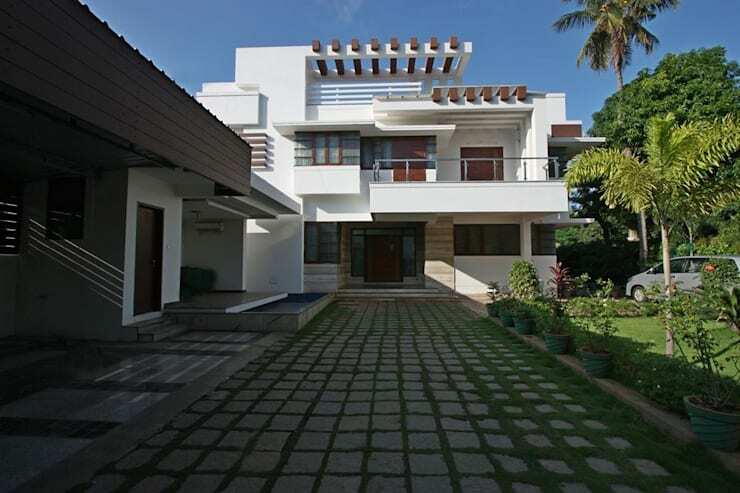 Simple and minimalistic design of the exterior. Main entrance of the house with wooden paneling all around. View of courtyard from the living room. 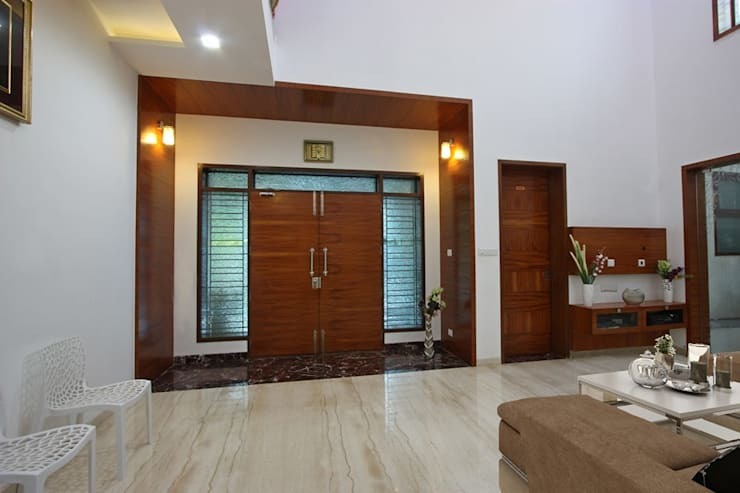 Glass door and partition divides the living room from rest of the functional areas of the house. Main entrance and passage in the first floor as seen from living room. View of double height false in the living room. 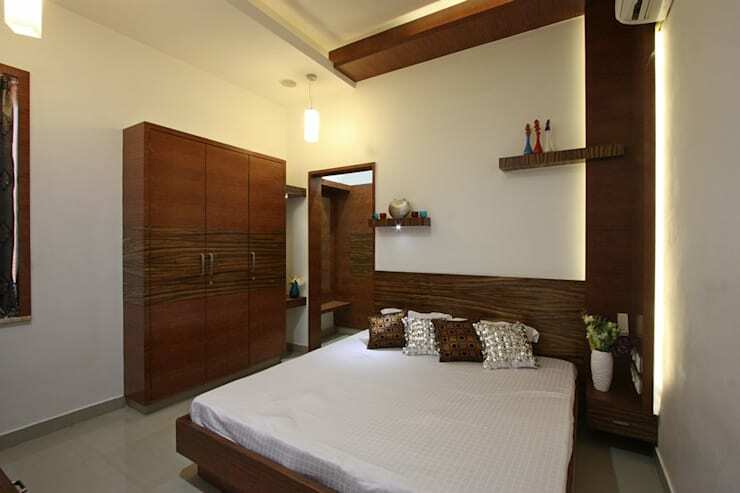 Parent's room in the ground floor designed in rich brown and white color scheme.